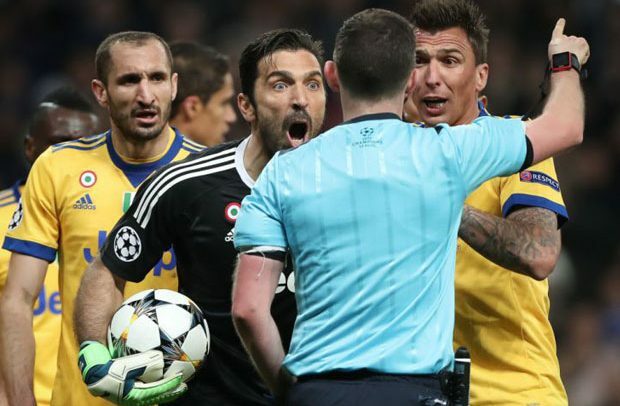 Juventus goalkeeper Gianluigi Buffon has refused to apologise to referee Michael Oliver following his side’s controversial exit from the Champions League against Real Madrid last week. Trailing 3-0 from the first leg, Juventus, extraordinarily, managed to claw their way back to 3-3 on aggregate but Oliver elected to award Real a penalty in stoppage time when Medhi Benatia was adjudged to have fouled Lucas Vazquez in the area. Buffon was livid with the decision and protested extensively, which resulted in him being sent off by Oliver before Cristiano Ronaldo dispatched the spot-kick past Wojciech Szczesny to send Real through. Although Buffon has now had time to reflect on the incident, he has no intention of apologising. Buffon told La Iene: “I don’t have to make up for anything, because I am a human being who puts passion, sentiment and anger into what I do.